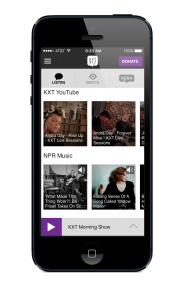 The KXT Mobile App allows you to easily listen to the KXT 91.7 live music stream (along with news and information on KERA 90.1), pause and rewind live audio and view the program schedule for both streams at once. You can explore on-demand content, search for stories, bookmark a show or story for later and wake up to KXT with the alarm clock – all for free. The KXT mobile app offers DVR-like controls featuring pause, rewind, and fast forward features. You can pause the live stream to have a conversation and pick up right where you left off — or rewind to catch a comment you just missed! Listen to KXT 91.7 live even while traveling! Start the app and your favorite station starts playing — no clicks needed to start listening. Enjoy integrated program schedules for both KXT 91.7 and KERA 90.1. Display up to three of your favorites at a time or flick once to see the schedules for all of your favorite stations. Flip over to the program you noticed on KERA 90.1 with a single click. Listen to KXT 91.7 in the background while browsing the web or catching up on email. Access your favorite KXT 91.7 programs easily and quickly and rewind, pause and fast-forward as often as you like. The KXT mobile app also displays the web page associated with the program or story segment you are listening to, so you can explore for more information. The KXT Mobile App is compatible with the popular Radio Bookmark device (www.radiobookmark.com). The unique “Search Public Radio” feature finds stories or programs across hundreds of stations and web pages and makes it easy to play instantly. Easily share stories and programs with family and friends via the “Share” button. A built in sleep timer and alarm clock allows you to go to sleep and wake up to your favorite station.